In the third installment in the Horses and Friends series, thirteen-year-old Kate Ferris already has one problem. Snooty, well-to-do Melissa is boarding her horse at Kate’s family stable. When Melissa suddenly turns nice, Kate is shocked ... and suspicious. 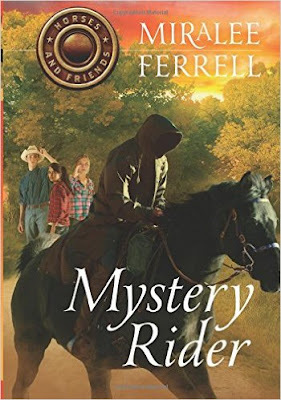 Miralee continues to develop the characters in their personalities in her 3rd book "Mystery Rider". Through her friends, Melissa has found her faith and increased her relationship with God. I love that the characters support for one another and their love of horses is what made the book great. I highly recommend the series of books to girls with a love of horses, or to anyone who is looking for a good read. The books are "juvenile fiction", but I myself enjoyed reading all four books in the series.